"Mashed kiwi, pineapple juice, lemon juice and sugar, with apples as a pectin source." In a large saucepan, combine 3 cups mashed kiwi, pineapple juice, lemon juice and apples. Bring to a boil and then add the sugar; stir to dissolve, reduce heat and simmer for 30 minutes. This is more like preserves. If you want jam, I would suggest using commercial pectin, instead of the apples. The flavor was exceptional. Very good recipe. This recipe has an excellent flavor. One thing I found was that 24 kiwis makes more than 3 cups of mashed berries. Mine made about 5 cups. Also - I had to cook longer than 30 minutes. This jam is great! When you peel the kiwis it is easer to cut them in half and spoon out the inside. 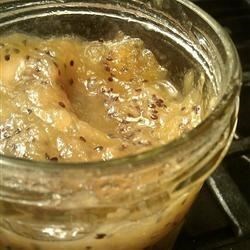 This jam is very good, I was a first time maker and was suprised at how easy it was to make. It tasts very good too. This came out great. My classroom of kindergartners loved it. They thought it looked like frog eggs.